A couple days ago Darcy and I headed off to Brent Cross for a spot of shopping, a bite to eat and to watch the lights be switched on. It was a great event, the children from the local school sang Christmas songs, and there were lots of free arts and crafts and face painting for the children. 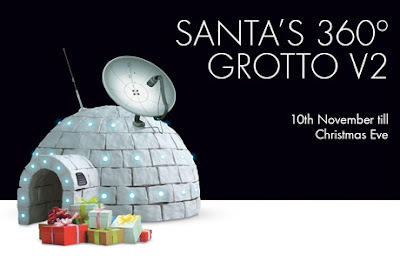 Whilst we were there I couldn't help but take Darcy to see Santa in his grotto.However, it is not just any grotto. It is a 360 degree projection igloo. Once you walk in you are greeted by the greatest man alive, Santa Claus behind a digital background, and who wouldn't want to meet Santa. Once seated, you are taken on a magical journey across the world finished off in Lapland to visit Santa’s workshop. It is very interactive and you cannot help but feel the Christmas spirit. I was a bit nervous, as last year I took Darcy to see three different Santa's, and she cried each time. But as you can see from the picture, Darcy was very happy to meet Santa. If you download the Brent Cross Plus app, you can get £2 off photo merchandise. 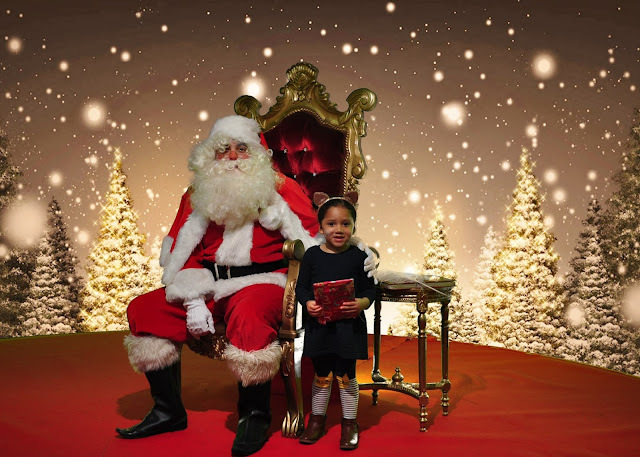 Santa's Grotto is opened from Thursday 10th November 2016 until Christmas Eve. Entry is £5 and every child will receive a free gift, Which I think is more than worth it. I'm always on the hunt for a good Christmas grotto, so let me know where you go.